Trex-Onics® Servo Motor Cables protect equipment from damage and extend conductor life in dynamic applications. With Trex-Onics® Servo Motor Cables, we’re able to match the customer’s color code and their need for a smaller O.D. TPC Wire & Cable Corp. (TPC) is pleased to introduce a new offering of cables designed to outlast the OEM product used with servo motors. Engineered for superior performance, Trex-Onics® Servo Motor Cables protect motors and related equipment from damage and extend conductor life in dynamic applications. Orange in color and available in four sizes, the cables are compatible with Rockwell/Allen-Bradley, Bosch Rexroth, Indramat, Kollmorgen, Siemens, Lenze, and Mistubishi drive systems. Trex-Onics® Servo Motor Cables feature a heavy-duty, tinned copper braid to serve as a shield against radiated and conducted EM and RF interference, reducing nuisance noise issues and delivering precision performance. Finely-stranded, tinned copper conductors offer increased flexibility and extend the life of the cable in moving applications. The conductors are also color coded to allow for quick and easy identification. In addition, a specially compounded jacket and insulation translates to a cable that creates a superior line of defense against oil, chemicals, ozone, UV exposure, and extreme weather. Though TPC routinely develops cable in a yellow color signature to its brand, the company has brought Trex-Onics® Servo Motor Cables to market as an orange product in order to meet the needs and specifications of target industries and customers. Trex-Onics® Servo Motor Cables benefit customers in a variety of markets including automotive, food & beverage, government, utility & alternative energy, mining, oil & gas, transportation, and wood, pulp & paper. 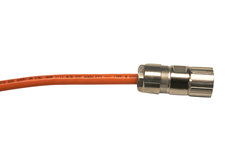 TPC is a leading supplier of high-performance wire, cable, connectors, and assemblies for harsh industrial environments. Products are designed and engineered to withstand severe abuse from flexing, impact, abrasion, chemicals, and extreme temperatures. TPC’s dependable products outlast ordinary cable in the most difficult applications, reducing downtime and overall cost. Visit http://www.tpcwire.com.